PWCCR publishes a Newsletter five times a year: Spring, Summer, Fall, Christmas, and Winter. Subscriptions to members are included as part of PWCCR dues. Non-members may subscribe at the rate of $15.00/year, payable by December 31st. Individual issues are $5.00 per issue if you subscribe at any other time of the year. 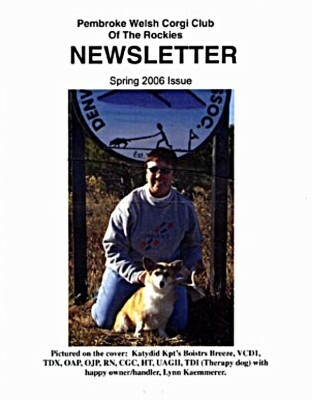 ​Any person who breeds or owns a Pembroke Welsh Corgi may advertise in the Newsletter. General dog-related advertisements are also accepted. We encourage all Corgi owners to celebrate the accomplishments and foibles of their charges. *PWCCR no longer has free access to a color copier/printer. While we would love to continue printing color covers at no charge, the cost is prohibitive, $.99 to $1.12 per page. If you would like to cover the cost of a color cover for any issue, please contact the Editor. Any member’s dog receiving a Group 1 or Best in Show or Obedience Title will receive a free cover, when available, with accompanying story in the Newsletter. Articles, ads, and photos need to be sent in at least two weeks prior to issue deadline. ​.PWCCR members are encouraged to submit their own candid photos, cartoons, and/or any other material that might be of interest to our readers. Individuals submitting another person’s work should first obtain permission to reprint in the Newsletter. Unless otherwise specified, articles appearing in this publication (except those copyrighted by some other party) may be reprinted without permission, provided proper credit is given and a copy of the publication is sent to the PWCCR Newsletter Editor. The Newsletter Editor will review all articles and ads prior to their publication and reserve the right to refuse any they consider inappropriate or edit any material submitted for inclusion. The opinions expressed in the Newsletter are not necessarily those of PWCCR, the Editor, or any other Newsletter contributors. The Editor accepts no responsibility for errors in printed ads.